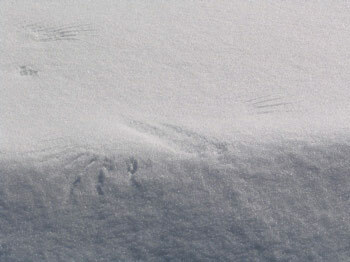 Ruffed Grouse In Snow. This ruff grouse was "fanned out" in a proposed timber sale area after a recent new snow. I've heard the crazy things drum in the fall too. Their rut typically starts here in march on the crusty snow. That's a cool picture and not that easy to obtain with the flighty birds near settlements. I see them in winter along the ditch of the road after cranberries, alder, poplar and birch seed or buds. I heard a grouse yesterday . It was just practicing , I guess. That is a great picture , Ron. I've almost stepped on them but not gotten any pictures. and I met up with them later , a little down the road. They seem to have found a friend in thier travels. While on holiday last week the beach house we stayed at was surrounded by small eucalyptus and pohutukawa trees. 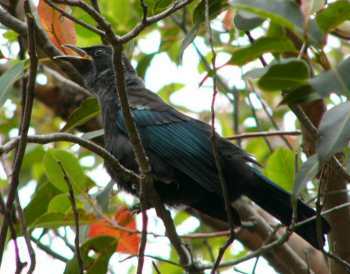 There were a couple of young Tui that spend much of the day hunting them for spiders and bugs. These are one native bird thats been able to adapt to the change in NZs environment. It is common in gardens and around farms as long as flowering trees are present. They eat mostly honey and insects. This young one hasn't yet developed the white tuft under it's chin that is so distinctive of the bird normally. They have a wonderfull song and are interesting playfull / quarrelsome birds. 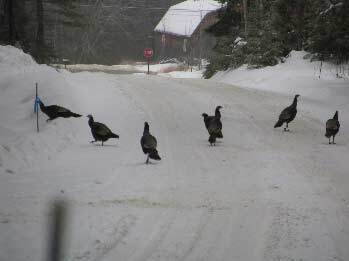 Wish we had wild turkey up this way. That's quite a flock of'em. Great place to release a few would be around Mars Hill with all the oak trees. I suppose they'de eat beechnuts and birch catkins in winter if they had too. Then there's always the 150 acres of corn to eat the farmer never harvested. There's about 5 inches of snow here in some places and less in others. Go away from the river valley, to the east and there is alot more because the elevation is higher. This mild spell and some bare patches have brought some robins north. Yup, my eyes weren't deceiving me, I saw a robin. It was making robin chirps and flying short distances ahead of me along the road as I walked this afternoon. It's not out of the ordinary, as I've seen them in mild winters here before. I was wishing I had my camera but it would be hard to get a discernable picture of such a small bird at 200 feet away. Here is the tenant of large bird house I make for kestrel's, owl's, woodpeckers, etc. I have this one mounted in a sugar maple in my yard. Every winter one of these little screech owls moves in. I never see them in the summer but most of the winter and spring they will be in it. They like to sit with their head sticking out of the hole in late afternoon. Just after dark they will come out and sit on a limb next to the house for a while. All of a sudden they will be gone and you won't see him again till the next afternoon when he sticks his head out again. I notice blue jay feathers on the ground once in a while. I think they like them. I have a picture to go with this post but have been unable to attach it for some reason. Help please. The picture posting is down for awhile untill the big guy gets the new improved version implemented. I got my owl's picture posted but now there is a funny looking leprechon with a red nose sitting on the roof of the birdhouse. How the heck did that happen? Well at least I was able to get a picture posted. After seeing your pic, I was wondering if you would have some plans or atleast the measurements for one of them houses? Or does anyone know a good place for free plans? Gonna be building a pile of bird and bat houses in a coule of weeks, and would like to build a few different kinds. Yes I have some plans around here someplace. I will dig them out later today when I get a chance. I have another publication that I picked up some place that has the specifications for different kinds of birds. I will see what I can find. I make a house scaled down from the owl house that I put up for bluebirds. They get used by a variety of birds. I get wrens, tree swallows, chickadees, titmice, nuthatches and of course bluebirds. It all depends on where you locate them. I also get deer mice, red squirrels and flying squirrels. Pain in life is mandatory. Suffering is optional. Well Furby I looked high and low and could not find the plans. Guess its a sign that you have too much crap when you can't find things when you want them. Well I did the next best thing and took some measurements off one of my boxes. I used green rough sawed hemlock lumber in nominal sizes. The material can be most any wood that is available in your local that will survive the weather reasonably well. Hemlock is a good choice in my area and is long lasting without any finish. The hole is 3" diameter and is placed 12" up from the bottom on center of the width. The top is placed flush with the rear of the box and overhangs the front 2" and 1" on each side. The bottom should be lined up so that the grain runs the same direction as the back piece and the front. That way the pieces will be parallel. The four corners of the bottom should be nipped off about 3/4" x 45deg's so that there is good drainage. The front should be lined up flush at the bottom with about 1/2" gap at the top for ventilation. You can nail or screw the whole assembly together to suit. Do not fasten the front though. You may have to trim the width of the front so that it will move freely in the assembled box. The front is made so that it pivots for inspection and cleaning. To do this place the front flush at the bottom and place a 2" galvanized roofing nail about 11" up from the bottom through the side pieces into the front. These are the hinges or pivots for the front. I usually clamp the front piece in position and predrill a pilot hole for the nails. I use a drill a few thousandths larger than the nails so that they won't bind in the side pieces. Drill only 1/8" or 1/4" into the front piece so that the pivot nails will be firm in the front piece. Then I take and drill a hole 1/32" larger that the roofing nails about 2" up from the bottom through the sides into the front piece. Drill this hole at a downward angle so that when the nail is in place it will not fall out. This nail is the latch that keeps the front panel closed. I usually place a couple handsfull of wood chips in the box. I also either notch the top of the side panels or drill some holes to get more ventilation. I had one of these boxes taken over by a wren a couple of years ago. Took him all summer to fill it up with sticks. Hope this is what you are looking for Furby. Good luck with your construction. Bitternut, that's waaaaay above what I needed, but ya made it easy on me, Thank YOU! I'm planning to use some aspen for this first batch. Don't really care if it don't last that long. Only cost involved is my time and some gas for hauling and cutting. Just want to get some up, as I don't have any in my yard. A purple martin house has been on my list for many years. Actually, I have a whole pile of requests for them, just got to get around to making one. Let's see - what do I have outside my backdoor? Ora Pendulas - weirdest call you have ever heard - Hey Jeff, can I upload sound here? Gaviilon Blanco - The locals call them eagles - pure white with black on the tips of the pinion feathers. Oh, and yesterday I saw a troup of Howler monkeys in the back moving through the trees, with a bunch of babies - I hear them all the time, but this is the first time I have seen them. According to Hector we have about 3 troups on the finca. P.S. If anyone is confused - just look where I live. Maybe his diet? We had a Bald Eagle a few years back that just sat on the ground and couldn't fly. He was brought to one of those places they take care of sick birds, but he was too far gone to save. They thought he might have been suffering/died from malnutrition. Can't quite figure that one out, unless they just get too old and feeble to catch anything. Fairly heavy snow cover +125" so far - feeding 2 Doves, 4 Bluejays, ? Chickadees, 1 Grey Squirrrel and 1 Red Squirrel that's pretty sure that he/she is the Boss. What You Don't Got - You Don't Need ! Trust em, if They Promise to Use Good Judgement Instead of Common Sense ! 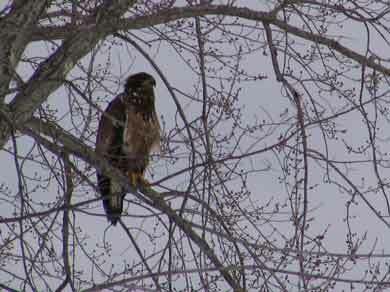 Yup, looks like an immature bald eagle, hasn't got his white feathers yet. Their first year is the harshest. They start nesting here in February also. She is living here for weekends as they like company and wouldn't like weekends alone. 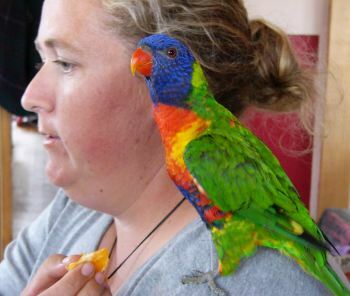 The Aussie members probably know them and consider them a pest, but they do make good pets. Page created in 1.139 seconds with 39 queries.